Fill paper-lined muffin cups two-thirds full. Bake at 350 degrees for 18-22 minutes or until a toothpick inserted near the center comes out clean. Cut a small hole in the corner of a pastry or plastic bag; insert a very small tip. Fill with pie filling. Push the tip into the top of each cupcake to fill. In a large bowl, beat egg whites and cream of tartar on medium speed until soft peaks form. Gradually beat in sugar, 1 tablespoon at a time, on high until stiff glossy peaks form and sugar is dissolved. Pipe over tops of cupcakes. 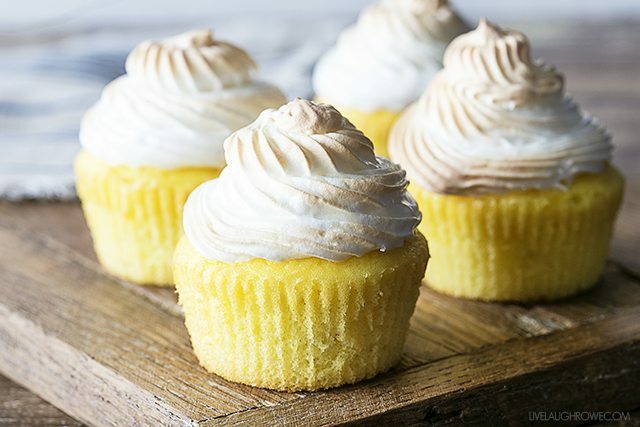 Bake at 400 degrees for 5-8 minutes or until meringue is golden brown. Cool for 10 minutes before removing from pans to wire racks to cool.